Happy Birthday Dylan, its me Tara. Tonight in Farmington there may not have been many in numbers but the strength, hope and love was. At 7pm 7 blue balloons and 7 black balloons were released into the night sky as we held our lights high and sang “Happy Birthday”. I brought a metal cross that is blue and had everyone sign it and I’m going to spray it with clear stuff and give it to your Mutti. I wish you were home on your birthday celebrating. Your here in our hearts and souls Dylan, we will NEVER EVER give up HOPE. My lighthouse is on tonight Dylan, like it is every night. Where are we posting from tonight? 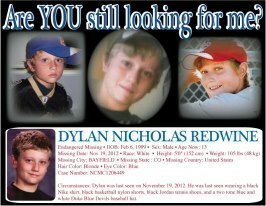 What happened to Dylan Redwine? KUSA – Dylan Redwine’s 14th birthday is next week, but his family is planning a vigil instead of a party. The teen disappeared Nov. 19, 2012, from the Vallecito Lake resort area in southwestern Colorado. Dylan Redwine Task Force investigators said they searched miles of countryside and interviewed hundreds of people, but developments in the case have now dwindled. They have no named suspects and no confirmed sightings of Dylan. In an exclusive interview with 9Wants to Know, the father of the missing boy says everyone, including both parents, remains a suspect in the disappearance. 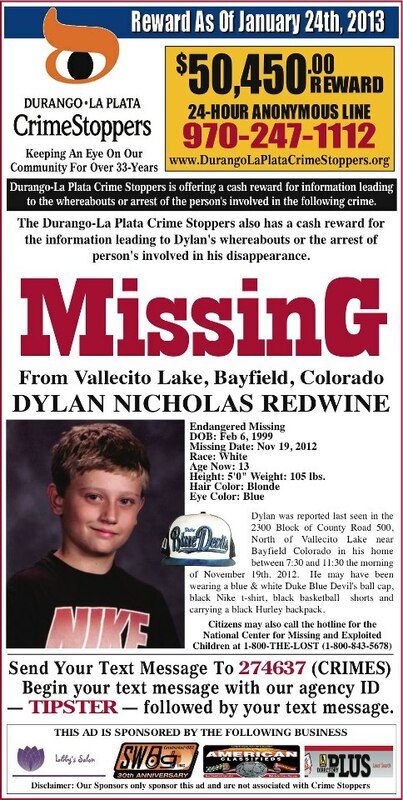 “They need to look at everybody,” said Mark Redwine, who was the last known person to see Dylan. Elaine has blamed her ex-husband for losing their son. Both parents, who had battled over divorce and custody for several years, deny any involvement in the disappearance. The Redwines do have some history of family violence. Dylan’s older brother Cory claimed that several years ago Mark took them. “He took me and Dylan once or twice and would not tell us where my mom was at,” Cory said. Mark Redwine’s first wife Elizabeth made similar accusations. 9Wants to Know obtained a police report from 1990. It alleges Mark failed to return their kids on time after visitation and claims he made statements about not returning the children. La Plata County Sheriff’s officials say they are aware of the old claims, and they say these kinds of things are common during custody disputes. A 13-year-old gone without a trace is not common. “The only possibility that we’ve ruled out due to the passage of time is that Dylan is a runaway,” La Plata County Sheriff’s Office spokesman Dan Bender said. According to a new timeline released by the investigators, Dylan arrived at the Durango airport at 5:46 p.m. on Nov. 18, the night before he vanished. His dad took him to a nearby Walmart where he was captured by security cameras at 7:05. At 7:22, they stopped at the Durango McDonald’s. Dylan sent text messages throughout the evening. Investigators say the last text went out at 9:37 p.m. Mark Redwine says he watched a movie with his son until about 10:30 p.m., and he went upstairs to bed as Dylan settled in for the night on the couch. Mark says he last saw his son at 7:30 the next morning. He said he planned to drop Dylan off at a friend’s house on the way, but Dylan was still snoozing when it was time to go. Mark says he handled a payroll issue at his company’s office and met with his divorce attorney, and when he got home at 11:30 a.m. Dylan was gone. Investigators say Dylan’s cell phone has not sent out a signal since he vanished. A black Hurley backpack, containing all the clothes Dylan packed for his Thanksgiving visit, also disappeared. “When Dylan left, did he take everything because he knew where he was going and who he was with?” Mark wondered. Dylan’s friends say that he had hitchhiked into town before, but no one remembers seeing Dylan along the one county road leaving Vallecito Lake. “He either left the house and someone abducted him or something happened while he was still at the house. I could not think of a 3rd possibility,” said Dan Bender, spokesman from the La Plata County Sheriff’s Office. Investigators searched Mark’s house and trucks. They looked through phone records and gave him a polygraph examination. They also took computers to search from Elaine’s home in Monument and gave her a polygraph test. The Sheriff’s Office has not released the results of those searches and tests. Dylan Redwine is 5 feet tall and weighs 105 pounds. He has blond hair and blue eyes. When he disappeared, he may have been wearing a Duke Blue Devils baseball hat, a black Nike T-shirt and black basketball shorts. Durango-La Plata Crime Stoppers is offering a reward up to $50,450 for information leading to Dylan’s whereabouts. Anyone with information is urged to call Crime Stoppers at 970-247-1112 or the La Plata County Sheriff’s Dylan Tip Line at 970-382-7511.